A set of 3 zebra puppets in different sizes. They can sit on shelves legs dangling, legs bended or legs straight. Arms are also movable. Sweet looking cat decorated with colourful flowers, front and back, hand carved in wood, stands tall and flat against the wall. Buddha trinket box made from washed stone beautifully with carved details. 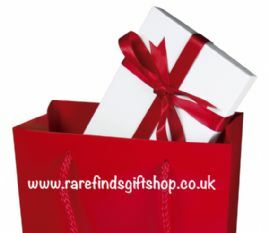 A gift from far, far away. 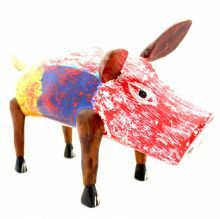 Multi-coloured little pig with dreamy eyes and fibre tail, carved in solid wood and polished finish. Something new and really different. 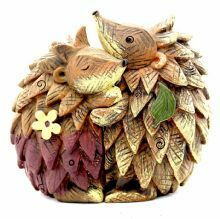 Hedgehogs hugging each other, very sweet, a nice gift for the other half in your life. Impressive, a standing frog holding a gold boat tray. 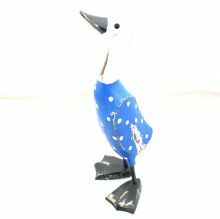 Handcrafted in metal, the design is not just beautiful but intriguing. 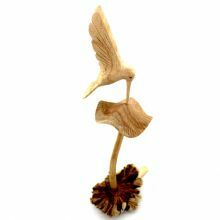 In perfect balance a hummingbird on a mushroom carved using parasite wood, There is so much details, this is a work of art. 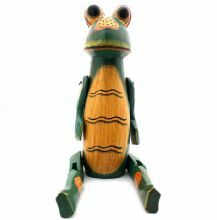 A wooden frog that can sit on a shelf, legs dangling, very interesting. The legs and arms are movable. Mr and Mrs Cat, carved in wood, hand painted front and back, flat rear, space saver can stand against the wall. Such a lovely couple deserves a place in any home.